Epcot – There are endless New Year’s Eve entertainment options at Epcot, allowing guests to party all night long. Dance under flame effects and a smoke-billowing dragon in China, revel in a British blast to the past in United Kingdom, jam to Euro-pop and admire lasers in Italy, groove to the beat of a Latin band and DJ on the America Gardens Stage, and enjoy unique entertainment including a DJ and light show at the Future World Fountain Stage. Two showings of “IllumiNations: Reflections of Earth” fireworks, at 6:00 p.m. and 11:40 p.m., followed by a countdown and pyrotechnic salute to the New Year will top off the celebration. 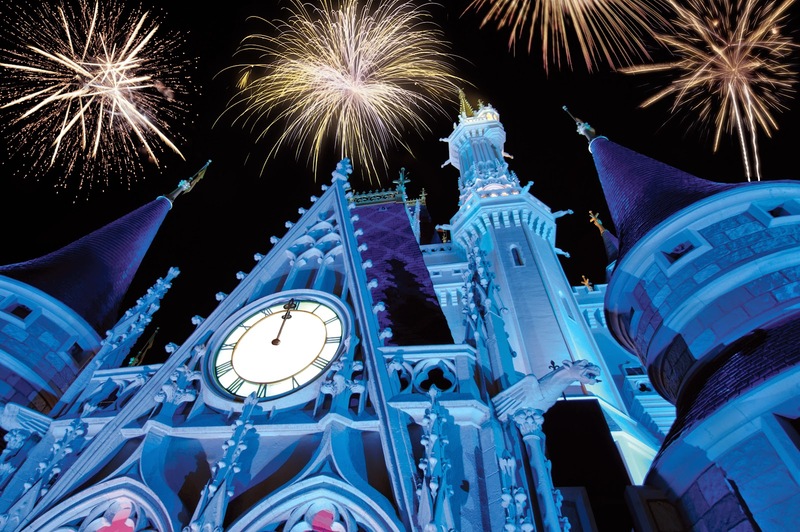 Magic Kingdom – Guests can get a head start on welcoming 2015 at Magic Kingdom with New Year’s Eve fireworks that will be showcased on two nights instead of just one. Tuesday, Dec. 30, and Wednesday, Dec. 31, a jaw-dropping presentation of “Fantasy in the Sky” fireworks will be presented at 11:50 p.m., both nights. Disney’s Hollywood Studios – Throughout the night as New Year’s Eve comes alive, guests can groove to the beat an energetic DJ will provide and rock out to performances by Mulch, Sweat & Shears on the Event Stage. The band, which covers rock ’n’ roll hits from the past, rocks the stage regularly at Disney’s Hollywood Studios, but this year, as midnight approaches, Mulch, Sweat & Shears takes the stage to welcome the New Year as it plays live during a stunning fireworks spectacular. Epcot – At Epcot World Showcase, options for lunch and dinner celebrations are virtually endless. Biergarten Restaurant in Germany is offering both lunch and dinner to guests; La Hacienda de San Angel in Mexico is offering dinner; Le Cellier Steakhouse in Canada has three seatings, and Monsieur Paul in France starts celebrating at 11:45 a.m. with seatings throughout the day and evening (reservations required). Tutto Gusto Wine Cellar in Italy and La Cava Del Tequila in Mexico are offering solid wine and drink lists and smaller plates for guests without a dining reservation. Magic Kingdom – For guests with a sweet tooth, Tomorrowland Terrace will feature a New Year’s Eve fireworks dessert party nightly during the spectacular shows on Dec. 30-31. For more information and for reservations, guests may call (407) WDW-DINE or visit WaltDisneyWorld/FireworksDessertParty. Disney’s Hollywood Studios – There will be no shortage of fantastic food at this New Year’s Eve party. A special holiday dinner buffet will be hosted by Hollywood & Vine. With a menu offering everything from carved turkey breast, to lobster and shrimp macaroni and cheese, to salads and create-your-own pastas, even those with the pickiest of palates will find something to enjoy. Walt Disney World Resort hotels – Guests can treat themselves to delectable dining this New Year’s Eve at several Walt Disney World Resort hotel restaurants. Flying Fish Café at Disney’s BoardWalk; Victoria & Albert’s and Narcoosee’s at Disney’s Grand Floridian Resort & Spa; The Wave…of American Flavors and California Grill at Disney’s Contemporary Resort; and Trail’s End Restaurant at Disney’s Fort Wilderness Resort & Campground, are all offering fine dining experiences for guests looking to make dining reservations.